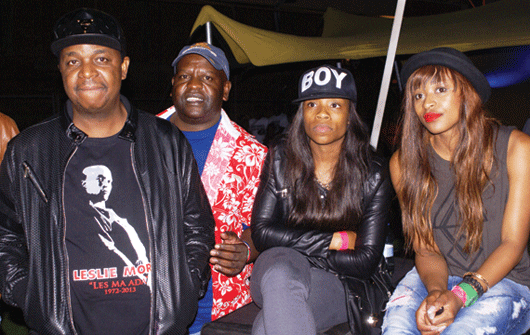 THERE were chaotic scenes outside the Queens Sports Ground on Saturday night as thousands of music lovers tried to make their way into the venue for the annual Kalawa Jazmee Homecoming party. Cops had difficulty controlling the crowd and set vicious dogs on fans resulting in a stampede and pulling down of the fence put up to control the inflow. While some people looked disappointed with the long queues and heavy rains, some entertained themselves by spinning their South Africa-registered cars in dangerous manoeuvres that blocked traffic on roads outside the venue, but delighted stranded fans. There was alcohol everywhere inside the venue and some drunken revellers were sprawling on the ground after having one too many while sporadic alcohol-induced fights broke out all over the pitch. Master of ceremony Ezra "Tshisa" Sibanda drew wild cheers from the visibly drunk revellers when he announced that the partying would go on till 11am yesterday morning. This caused a lot of pressure outside as fans jostled to force their way into the venue. Sibanda told fans that comedian Babongile Skhonjwa, who was supposed to be his co-MC at the event, was recovering in the intensive care unit at Mpilo Hospital after the horror crash he was involved in on Monday last week and promised to be present at the 2015 party. Singer Berita Khumalo, who bragged about her Nketa roots in Bulawayo, was the first to take to the stage and wowed fans with her hit song Thandolwethu. She went on to entertain with a new release dedicated to Bulawayo men called Bulawayo and closed her set by promising to shoot a video of her recently released album in Bulawayo. Delaney "Diliza" Dondo told fans that he was born in Bulawayo and was next. He showed off his well-choreographed routines with his newly recruited group Stiff. Trust Madolo of the Bhatshi fame, DJ Sbago and Defined House are some of the local artistes who had the privilege of sharing the stage with Kalawa performers. South Africa-based Buffalo Soldier revealed that he is from Luveve. After his performance the dancehall singer was booed and fans pelted him with cans and bottles shouting that dancehall was not appreciated in Bulawayo. urged the ecstatic and uncontrollable crowd not to throw bottles on stage saying this was dangerous and could cause him to enter into the new year without a functioning eye. Brickz performed his hit songs and threw in a few from the late kwaito star Brown Dash. However, the crowd's favourite was undoubtedly Bonginkosi "Zola" Dlamini. Fans sang along to all his songs such as Ngiyakuthanda Ntombazane and the self-titled song Zola. Multiple award-winning kwaito group Bongo Maffin also took to the stage remixing dancehall and reggae tunes. The much-awaited DJ Oskido took to the turntables remixing tunes from dance-pop, hip-hop, dub step, rock and house and assured the crowd that they would close the show at 11am and bragging that it was the biggest in Bulawayo. Speaking to Southern Eye Lifestyle, one of the organisers of the homecoming show, Vusumuzi Siqalaba, said he was overwhelmed by the attendance. "The show was good despite the rain. Compared to last year, the numbers went up and I put a rough estimate of about 7 000 people. I was also impressed by the performances, especially that of Zola," Siqalaba said.